Synopsis: A Tramp tries to commit suicide by drowning himself in the Seine River only to be saved by a Bourgeoisie man who takes the Tramp into his home and tries to change his ways. This movie is Renoir at his most masterful. Jean Renoir’s films have inspired all of your favorite filmmakers from the New Wave to Wes Anderson. 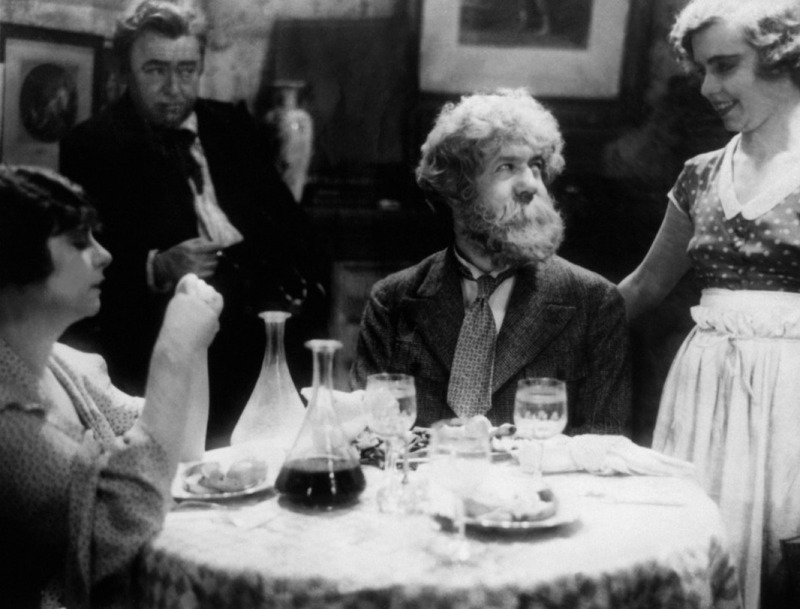 Renoir’s films are gorgeous, introspective and incredibly provoking as critiques of humanity. Renoir often deals with classism and Boudu Saved From Drowning is no different in its creation. The film starts with Priape Boudu (Michel Simon) playing with a dog in a park. Boudu is dirty, childlike, and quirky without pretension. 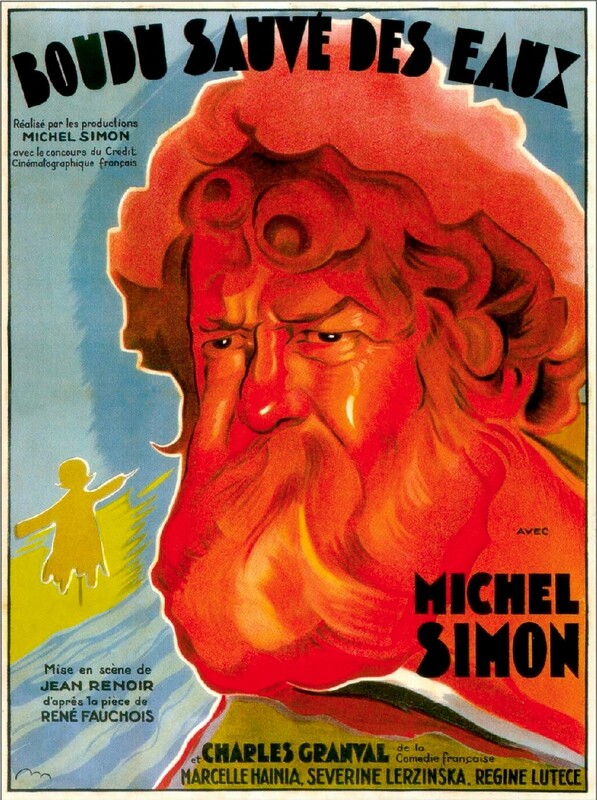 Renoir is such a great filmmaker that he lets the viewer grasp Boudu by showcasing the environment; the rococo-ness of the park and Boudu’s rough exterior contrast so well together with the genius acting of Michel Simon. There is no excessive exposition in his films as he focuses exclusively on the moment at hand. Renoir has some neat scenes where the dog that Boudu is playing with runs into water (Subtle foreshadowing) and a Bourgeoisie Woman is searching for a lost dog in the park. 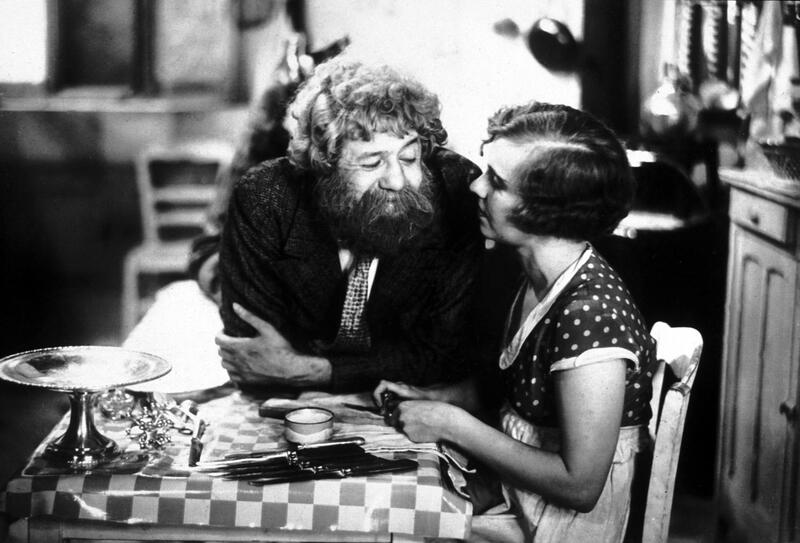 The film leads to Bookseller Edoard Lestingois (Charles Granval) staring through a telescope spotting homeless men in the street. Lestingois sees Boudu jump off the bridge and into the River Seine. He rushes out into the street and jumps into save the drowning Boudu. A crowd of men surround the water. One of the men remarks something to the effect of “How noble someone of our class risked his life to save him”. Lestingois and Boudu are fished out of the water by a ferry and later taken to Lestingois’s house where he performs CPR on him. Boudu quickly comes to himself and begins to hit on the maid. I just thought that was so clever and unique. The actors played so well of each other. Emma’s exasperated expressions are called “tics” by an ignorant, manner less Boudu. The interactions between the maid, Anne-Marie (Severine Lerczinska) and Boudu are very charming as well. The maid serves as the mistress to Lestingois she is very witty and funny in this film. She is the half way point between the world of Boudu and that of Lestingois. She is blunt in her initial dislike of Boudu. But Boudu eventually disrupts Lestingois and the maid’s affair and later has an affair with the maid himself. Lestingois’ wife succumbs to the charms of Boudu after he destroys her room and is told to talk with Emma by Lestingois. For some reason the shot of the painting of a trumpet player that later leads into the group on the street of a parade was really neat to me because it was a unique bit of transitioning that makes me love Renoir even more than I do. Boudu at this point is clean shaven and wearing a nice suit but is still a vagrant at heart as she spits in books by Balzac and is just gross overall as a human being manner wise. Boudu eventually wins the lottery in the film and is set up to marry the maid at the end but he capsizes the boat and runs away by water the same way he came. I love this ending because we were introduced to Boudu by water and now he is being carried away like the river of absurdness that he is. This performance by Michel Simon is very Dadaist and that is why I find it one of the greatest comedic performances in film history. Simon’s Boudu is childlike but knowing, odd but somehow incredibly normal. The ability to make a character like that so real showed his giftedness as an actor. He really dominates the film and when he is not in a scene you easily slip into the lull of the beautiful script. When Simon is on it is electric and he elevated this film to masterpiece. This film is one every film lover should watch as it serves like the template for every single buddy comedy out there known to man. It is very Dickensian but also very French. A great choice of film to review, and you describe it very well. I saw this again a few years back, at the National Film Theatre, in London. I enjoyed it even more, second time around, and can confirm your assertion that this is Renoir at his best. As you say, something that every lover of Film should really try to see.